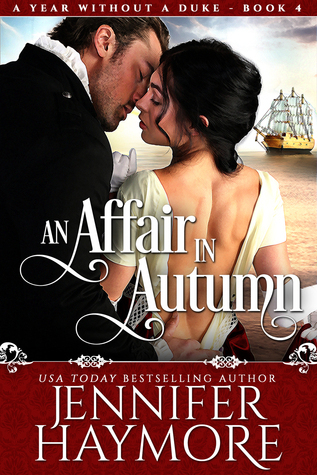 Jennifer Haymore writes very steamy romances. And I love them! I'm looking so forward to her every new piece of work and I was honestly surprised when I saw this one. I was even more "Oh my God!" when I read who was the hero! Lord Marcus Hawkins, from the Trent family, which I adore! What could have I asked more??? Maybe a full novel, instead of a novella...but to be fair An Affair in Autumn is so well calibrated and written that I didn't feel much the difference. Marcus is Marcus. I liked him since the first novel in the series, him and Theo caught my interest more than the other bothers, at least at the beginning. He is so passionate and manly! You will need a fan to read Haymore's romances. The heroine is Caroline; her and Marcus know each other since they were little, however something has broken their friendship and now a cold dislike stands between them. Obviously behind the acrimony there are hidden strong feelings, longing and regrets. When they finally cannot avoid the proximity and attraction anymore a storm of passion explodes and here you will need the fan I mentioned above. This romance is part of a series of five books written by five different authors.